It really seems as if this job is tailor-made for me. Why do I say that? I say that because at my current job, the students are required to use stations. Why is this perfect? Well, at my other school, I used stations. I just called them centers. I thought there wasn’t a difference, but have since learned that there is. So, my principal came into the class four times this week. Yes, four times. I’ve already had 5 observations this year and it’s only the third week of school. If this school does nothing else, it will keep me on my toes. We are required to upload a digital agenda to the school’s website, submit a unit plan, use stations for Direct Instruction, Collaborative/Flex-time (Work from other classes), & Independent work (on the laptop and/or iPad). I have actually really been “on it.” In my room I have a Smart Board that I am learning how to use. I know how to use simple parts of it, but the more complicated tasks like writing on the screen with the markers and moving screens like a touch device, I can’t do yet. The way I use it now is to plug my laptop into it to show my power points. I’ll write more about the power points later. This post so perfectly sums me up. I want to bronze it and put it on my dining room wall with the rest of my pictures. I am so often misunderstood by those who don’t know me. I really vibe with this post. Thank you, Lessons From the End of a Marriage, for writing this. I could have written this. It sums me up perfectly. I’m not an extrovert, but I play one in real life. Most people would probably be shocked to discover than I am a true introvert – that social situations and crowds exhaust me and I seek balance by being alone. After all, I have chosen to be a teacher. I am outspoken in meetings and not shy to speak in front of a group. I have intentionally cultivated a large group of friends and I enjoy spending time with them and having them in my space. I have developed countless online relationships and enjoy time with my online family. I can be loud. I rarely slow down. 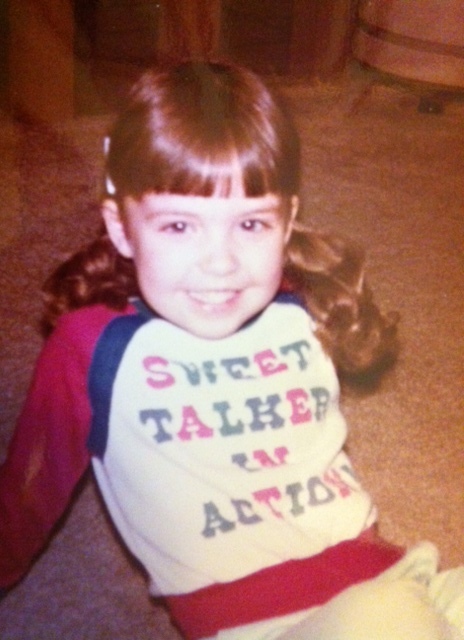 And I rocked a shirt that said, “Sweet Talker in Action” as a kid because I never shut up. I am exhausted. I didn’t mention that I teach High School Resource..in 2 hour blocks. Let me tell you that it is exhausting. Since I am exhausted, I will write more later. Will write more later. Tomorrow I am going to Well, I actually haven’t figured it out yet. As soon as I finish writing this, I’m going to continue working on a unit plan. I have to start from the bottom then work my way up. Instead of writing it down here, I will write it down on the unit plan template, so bye for now! No Sunday Night Blues Today! This time last week, I had the Sunday night blues! BAD!!!! I was so super stressed out that I thought I was going to burst a blood vessel. I’m really not kidding. It was because I didn’t know what to expect, didn’t know if I had enough material. I. JUST. DIDN’T. KNOW! Now that I have a whole week under my belt, I am much better. I had a very relaxing weekend, went to Lakeshore, finished school shopping with my daughter, visited my sisters and my nieces and their children, relaxed, watched a couple of movies, etc. All things that I couldn’t do last weekend on account of the stress. I figure I’ll be very comfortable with this whole process in about 2 months. by the time I will not have to bring work home. I will utilize my assistant who’s very efficient. I’m under the gun right now, but I am looking forward to very productive and exciting year. Here’s to expectations!